Submitted by witness on Thursday, January 31, 2008. LOCATION DETAILS: From Chadron, you head south on US hwy 385. You begin to climb from Chadron's level on the plain up onto the Ridge, first crossing Chadron Creek, passing Chadron State Park (on the right). Red Cloud Campground is the first turnoff on the right just after Chadron State Park. The elevation is around 3500 ft at this point. OBSERVED: I had never thought of looking on the internet to report what my ex-girlfriend, a friend, and I saw one night. Didn't know a nationwide report site was on the net. At the time we were students at the local college. We drove one night out to Red Cloud campground, adjacent to Chadron State Park, and parked in a parking pad at a campsite. We were in the car with the windows up. I recall the exact campsite. It was a full moon on a fall night in September of 2003. The grass was still green. This location is in the Pine Ridge, an escarpment, a part of Nebraska National Forest, just adjacent to Chadron State Park. We were parked facing up a ridge. We had been sitting for about a half an hour, when uphill in an area clear from some trees (this area is mostly covered by ponderosa pine trees), about 40 ft away we saw something on two feet run across our view out the front window, had to be running at least 30 miles an hour. From the silhouette that we saw, it was very tall, not exceptionally bulky. It had a rangy or sinewy build and looked muscular from the silhouette. It was a full moon, but there are no lights in or around this campground. It ran by way to fast to notice any hair features. We all looked at each other, like, "What the f*** was that". We were all bewildered, and my girlfriend was really scared. I definitely knew we had witnessed something extraordinarily strange, and we got the hell out of there. We didn't even go around the loop to turn around because that was toward where it was running. Note that we knew there was no one at all parked or camping up there while we were there because we went around the loop upon entering. We went back there the next day during the daylight to see where it would have been running. There is a lot of brush, grass, stumps, and bushes where this thing was running through, and in my opinion, there is no human that can run that fast through there even in the daytime. I've told people I might have seen Bigfoot, but like most people, they just think I'm full of it. I don't lie, and I would never have anticipated seeing something like that. As to my knowledge at that point, there were reports of Bigfoot in the Pacific Northwest area, not Nebraska. I camped at the campground last summer with my current girlfriend. Didn't see anything unusual, but got really bad vibes after revisiting my past memory. We were the only one's camping out there. Every other time we went camping out there it was with multiple people. OTHER WITNESSES: Two other witnesses besides myself. We were hanging out. OTHER STORIES: This is strange, and I know no other details but could inquire, but someone my girlfriend knows well told her that a long hike back into Chadron State Park he found a dugout cave (the area is sandstone/limestone) where he thought someone might be living. I asked her if he had seen anything human related, and I guess he made no mention, and hadn't entered it (for fear that whoever, or whatever, I guess, might be there. TIME AND CONDITIONS: Somewhere between 10pm and midnight. 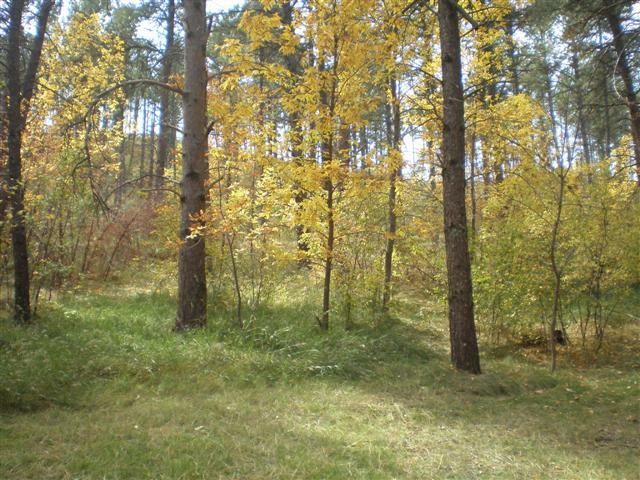 ENVIRONMENT: Campground is on the Pine Ridge, a limestone escarpment covered in ponderosa pines. You drive up a short short road to get to the campground level. There is a ravine between the campground and the highway. The campground road parallels the highway, ending in a turnaround loop that surrounds a thick bunch of trees and a National Forest outhouse. Up the hill and over, is a valley area, and across that is another ridge. You can climb up hill towards the south, and you keep going up this ridge, narrowly along a trail. I interviewed this witness for over an hour and found him to be credible. At the end of the interview, I told the witness that I also attended the same school decades ago and hunted and fished in that same area. I have been to that exact spot many times. The only thing that can be added to this report is that the creature was pumping it's arms like a human runner. The speed of the creature running from one side of the clearing to the other was mentioned several times. Never did it appear to be looking at them nor facing them, so it was all a side profile. It was moving too fast to get more details such as head shape, hair and width. There are other documented reports in this area of Nebraska.